Amherst - For a generation of visitors to Amherst, the small yellow building on the Town Common was the place to pick up maps, bus schedules and guides to the town's attractions. Nearly a year after the wooden hut was removed from its 50-year perch at the corner of Spring and South Pleasant streets, the former information booth has been transformed into a walk-in cooler for organic fruits and vegetables by Bill and Connie Gillen of Sunset Farm in Amherst. Bill Gillen unveiled the cooler at his 20 Brigham Lane farm stand in July after making numerous improvements to the building that he believed would be a nice addition to the streetscape. "I thought of it as a place for the neighborhood," Gillen said. "Everyone loves it." 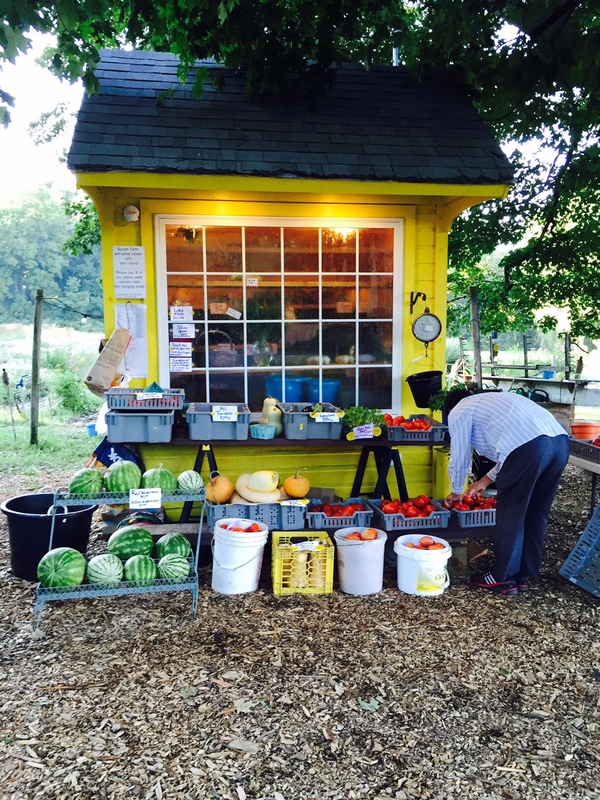 Previously, the farm stand had several benches and tables set up holding buckets of tomatoes, apples and cut flowers and a range of other products grown on about 15 acres. Leaving intact the discontinued Chamber logos near the roof line, the building, measuring 8 feet long and 6 feet 6 inches wide, looks much as it did when volunteers were stationed inside to greet tourists arriving in Amherst and hand out pamphlets and directions. But inside, where the air conditioner is set to 50 degrees, are potatoes, tomatoes, carrots, peppers, beets, leeks, homemade pickles and three different kinds of eggplant that people can purchase. Donald Courtemanche, executive director of the Chamber, said he is amazed at what Gillen did to what had become a run-down building. "I think it's awesome," Courtemanche said. "It's blown away my expectations. I can't think of a better second life for the former visitor's center." Courtemanche observes that in a community that promotes reuse and sustainability, it's an appropriate repurposing to avoid having the building end up in a landfill or incinerator, and fits in with the values of a community that appreciates agriculture. "We're glad it's in good hands and we're glad it's being used to promote one of my favorite industries," Courtemanche said. The decision to move the information booth was made in summer 2014. Courtemanche had seen the increasing use of smartphones diminish the need for paper products. The hut had become an attractive nuisance, with homeless people loitering inside, broken windows and graffiti covering its exterior. "To me it was beyond any economic return to fix it for my use," Courtemanche said. When Gillen, who served as a former president of the chamber board, popped into the chamber's offices on Amity Street a year ago, he told Courtemanche he wanted it. Once disconnected from power, the booth was picked up by a bucket loader and brought by the Department of Public Works to his farm to begin the renovations. "Structurally, it was in fine shape," said Gillen, who was given the building at no cost. Gillen estimates that he spent around $5,000 to convert the former booth into a walk-in cooler. This included adding a new fiberglass-framed show window to the front, and adding cellulose insulation to the walls and floor. Other windows were removed and patched with the same drop-leaf wood siding, and new shelving was installed inside. After more work to firm up the building, it got a fresh yellow paint job by Gillen's grandson, Dylan, of Belchertown. Courtemanche said motion detector lights are what amused him the most about the information booth's new look. Two are embedded beneath the large overhang and two are inside, which light up when people approach or a vehicle passes by. These lights seem to have scared away some critters that appreciated the fruits and vegetables. "We used to have stuff out, but squirrels, wind, sun and rain would destroy it," Gillen said. "We wonder if this is the reason the squirrels have not nibbled on items on the table in front of the stand." Gillen said he considers the new cooler a success because the farm is doing better business since it was put out in late July. "On-farm receipts have increased since last year," Gillen said. Many who drop by remember its presence on the Town Common. "They recognize it real fast if they live here," Gillen said.